The name of the game? Productivity, optimization, and big numbers. Here is a 365-days long story short. 70% of employees spend about 15 minutes per day searching for a place to meet. It might just be a couple of minutes but those minutes add up. And when you do the math you realize that in one year, a business with 50 employees wastes up to 2,100 hours on finding meetings. That’s 50,000 USD saved per company. 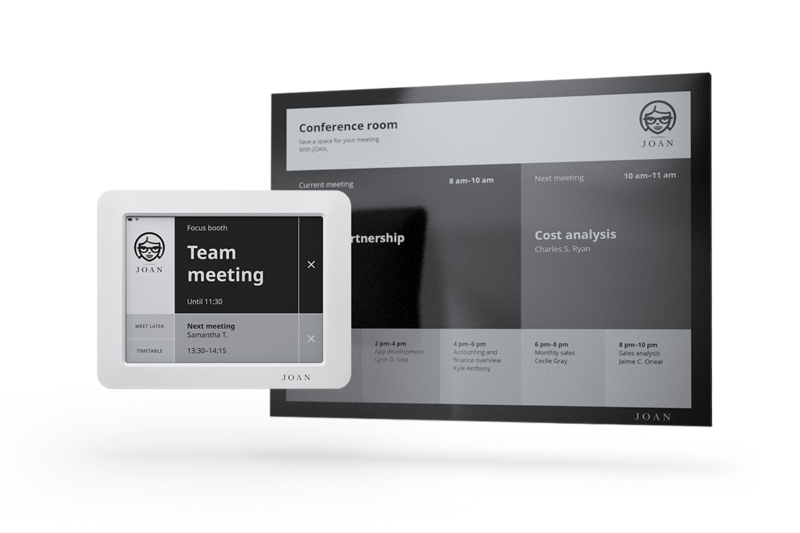 Joans all around the globe are helping schedule thousands of meetings daily. From small startups to established brands, organizations worldwide are opening their doors to the modern workplace and with it a place for meeting room scheduling systems. All of us should, but this specific reminder is one among many of Linus’ personal engagements. We sent two of our devices to the Linus Media Group and after completely clogging Linus Sebastian’s schedule Joan was picked up by TechnoBuffalo and yoyoTech who finally found the scheduling system they were looking for. In this past year, Joan successfully detected and canceled almost a hundred thousand unattended meetings across all of our users, freeing up an astounding average of 1,399 abandoned meeting hours per company. Our foosball table (got you) successfully withstood numerous tilts, illegal handle spins, and a grand total of 22,000 goal-scoring shots. What’s the wager? Physical exercise. The losing team must do ten push-ups (or squats) plus the difference in score. Collectively that’s 40,000 just this year. The hidden heroes. Never fear, our support team is highly skilled and trained to deal with all sorts of Joan-related emergencies. But in case they’re not home you can always find your answer in Joan’s Knowledge Base, the collected treasures of ten years of customer experience. Our developers are making sure that Joan stays a premium quality product. With daily routine tests, about 230 per device, you can rest assured knowing that your meeting room booking system is at the top of its game. So now you know that we care about our minds and bodies, but what about our entertainment? Knowing the Joan team it was only a matter of time before we put together a proper party. A Dungeons and Dragons party that is. And as if that was not enough magic, we picked up Magic: The Gathering as well. No matter where you are, Joan will find its way to you. With free express shipping and global coverage, there’s nothing standing in between you and a properly scheduled meeting. One office at a time. JOAN TEAM WISHES YOU A VERY PRODUCTIVE YEAR.